Figure 1. Hanging Man pattern. This article is devoted to the Hanging Man one-line pattern. 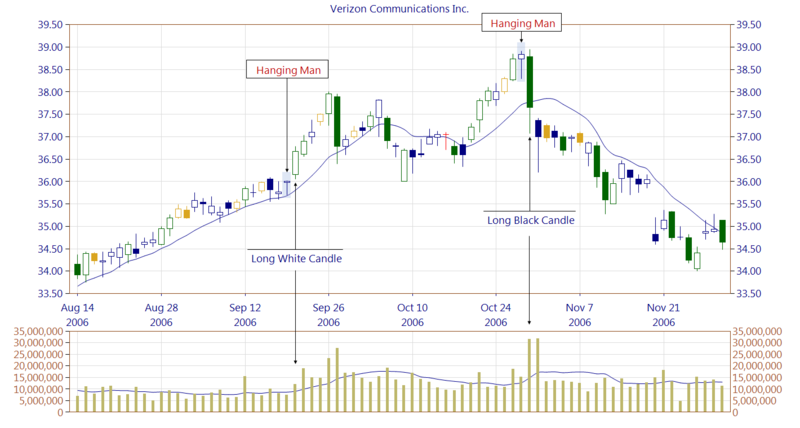 Hanging Man is a pattern that is very popular among analysts similarly as the opposite Hammer pattern. Perhaps this is a consequence of the impressive name referring to the shape of the candle resembling a hanged man. Pattern appears in an uptrend as a long line, and is characterized by a long lower shadow -- at least two times greater than the body. Almost all sources allow minimal upper shadow, so we assumed in CandleScanner that its length cannot be larger than the body. Hanging Man belongs to the bearish reversal patterns group. However, if a strong support zone was developed prior pattern occurrence, it is often just a temporary slowdown of price increases. It works best in a longer uptrend, and its occurrence after several days of increases usually does not matter. Correct interpretation of the Hanging Man pattern requires thorough analysis of the market on the chart. The meaning of the pattern will be stronger if it occurs in a significant resistance zone. As every one-line pattern, it must be confirmed in two or three consecutive candles, which closing prices should be lower than the closing price of the pattern. However, as with other peak patterns, many active market players open positions without waiting for any confirmations. Hanging Man pattern may be formed in the second line of other patterns such as Bearish Harami for example. Figure 2. The figure presents two occurrences of the Hanging Man pattern. The first occurrence was a false signal, a good example that such patterns should be confirmed on the following candles. Long White Candle, formed at a high trading volume was enough to cancel the Hangin Man. 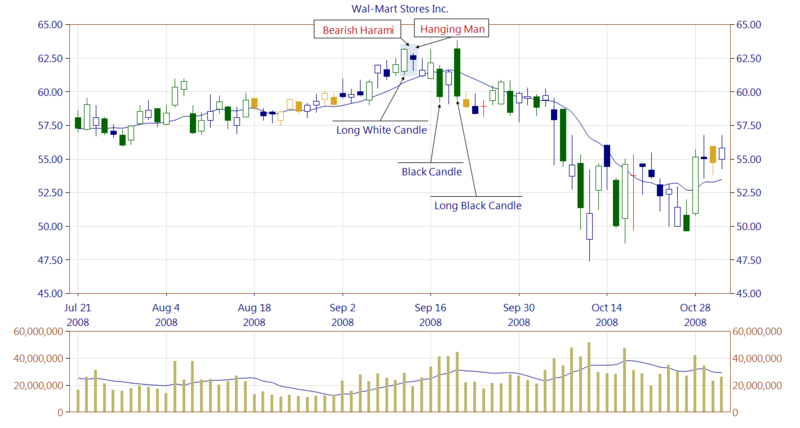 The second Hangin Man pattern is confirmed by the Long Black Candle. It is worth to pay attention to the length of both long candles. Long White Candle body seems to be much shorter than the Long Black Candle. However, this is a result of the fact, that prior the Long White Candle, the market price volatility was lower than the one preceding Long Black Candle. Figure 3. Hanging Man commonly occurs as a part of Bearish Harami pattern. The first line of the Bearish Harami pattern being a Long White Candle seems to be a bullish signal. It creates a significant support zone, strengthened by a high trading volume. After the appearance of Hanging Man, the overall trading volume increases on both sides, i.e. the bulls and the bears. 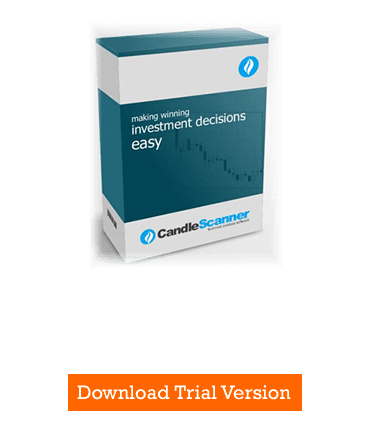 Below you can find some Hanging Man pattern statistics calculated by CandleScanner software. To see more detailed statistics, for other markets and periodicity try our CandleScanner software. Prices start at only $10, and you can see more detailed statistics, for other markets and periodicity. Click here to find out more!